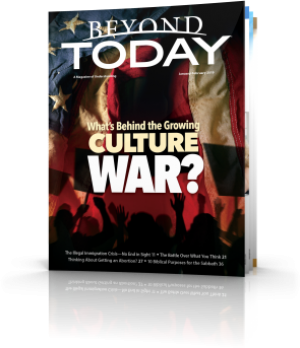 What’s Behind the Growing Culture War? The news headlines show the United States not to be united, but to be deeply divided over the nation’s past, present and future. A major reason for this is that, as the nation has drifted far from God, many have forgotten (or never knew) what the Bible says about many major cultural and societal issues. America stands at a crucial crossroads, and the stakes couldn’t be higher. You need to understand what the Bible says about the culture war transforming America and Western civilization! Download this issue in PDF or read online. Subscribe free to Bible Insights Weekly eletter. Cancel any time. or, click here to access the magazine without providing your details. Powerful, dangerous forces are executing an all-out war in America, as in other Western nations. They are striving relentlessly to transform the culture into something previous generations would never recognize. You need to know not only what is happening and why, but what you can do about it. As debate between those who want secure borders preventing illegal immigration and those who want open borders rages on, the crisis continues to grow. Can a Nation Commit Suicide? All of the knowledge, wisdom, human ability and intelligence, mean little unless we are sustained by God especially in our infirmities. Scripture teaches us much about the indwelling of the Holy Spirit and its power of intercession. How does the Holy Spirit assist Jesus Christ's true followers to assist them when they pray to their Father in Heaven. Halloween is celebrated on the eve of 31 October. Australians are indeed embracing Halloween in greater numbers and spending more money on this festival. Halloween decorations are more readily available in the shops and online and people are embracing this festivity with greater enthusiasm. Is the celebrating of Halloween just harmeless fun? What does the bible have to say about it?